There's a few things that I really enjoy above all others. You know, a few shops or places that you always enjoying going to and always find something you want. 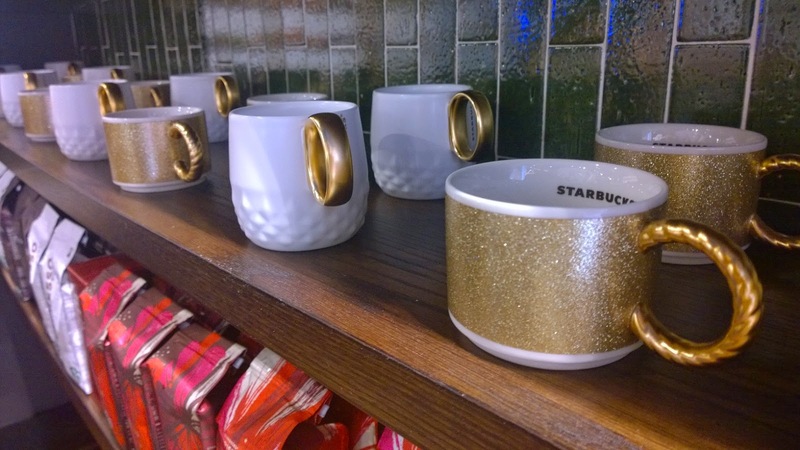 For me, those places include Pandora, Paperchase, Next, Starbucks and, perhaps most of all, Cath Kidston. I love everything about Cath. The bold, fun prints, the modern vintage clothes, the cute kids accessories, the beautiful homewares. I can spend hours wandering around, finding something on every table and every display that I'd like to take away with me. Ever since I went to the Craft bloggers meet up in Nottingham at the start of the year and had a sneak peek at how Cath chooses new prints, I've regularly kept an eye out for the new designs and products and often posted about what I've found, including her brilliant prints for boys and my pick of the new prints. This season, there's some fab new prints, naturally, including townhouses - which has also been used within a lot of the Christmas 2014 collection combined with the ever popular stars print - the new mews floral prints in navy and red plus a festive twist on her London and Stanley Dog prints too. The clocks, autumn bloom, London buses and 'stop that thief' prints are still to be found and, in many cases, they're in a sale at the moment too. So, how could I resist picking up a few things when I went in at the weekend? When it comes to prints, I don't go for matchy-matchy - I like to try and get a little something from all the prints I like for a more eclectic look. First of all, I was keen to snap up the mews print jewellery roll, as whenever I go away, I never have anything to pop my jewellery into plus this print is super cute and the fabric has a nice shimmer to it. It's also presented in a beautiful pink box, which will certainly find a use somewhere else. 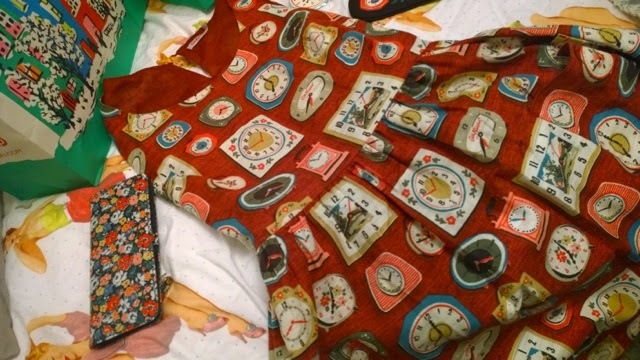 I also picked up a clocks mirror for just £2 (always handy to have) and decided to swap my current CK purse for a slimmer version which is mainly for cards but has a small change pocket at the back. I chose the ditsy mews print again but in navy and this was also in the sale for just £14. The main thing however I wanted to get in the sale was a dress. 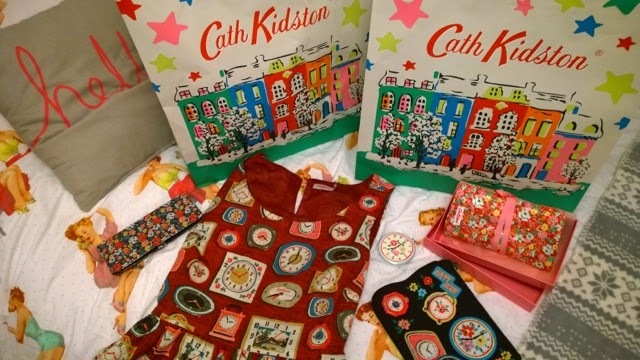 I've always admired them but have never bought a Cath Kidston dress before but having fallen in love with the red clocks print a few months ago, when I saw it had 40% off, I just couldn't think of a reason not to buy it. So I did. 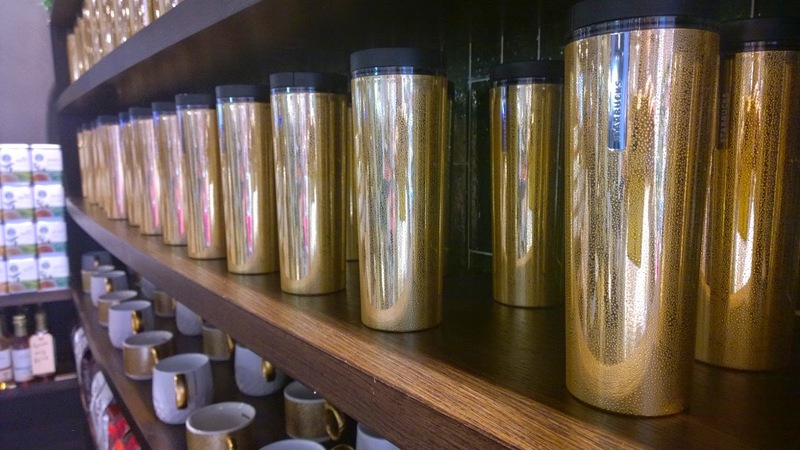 And it's beautiful and no doubt it won't be the last I buy (although not for a while!). 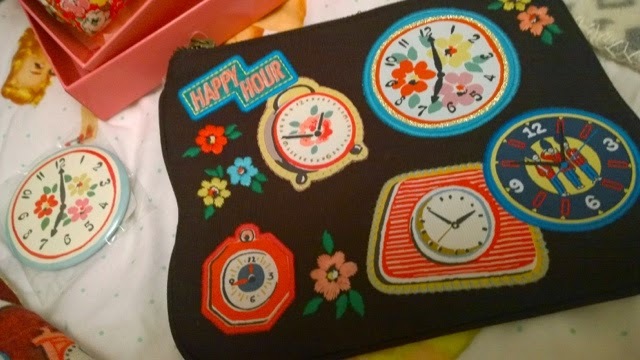 To match, I also grabbed the black happy hour clocks purse. 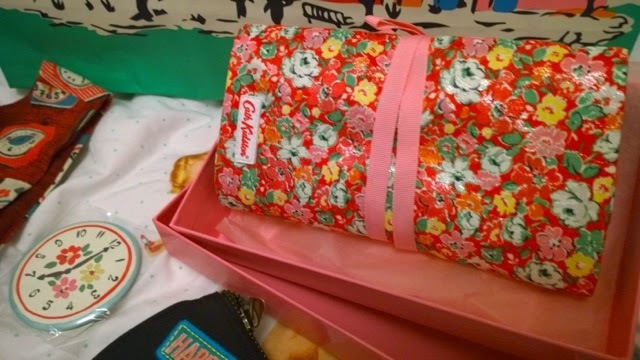 It's in a heavier material and I'm planning on using it as a clutch but it would also be great as a make up bag. 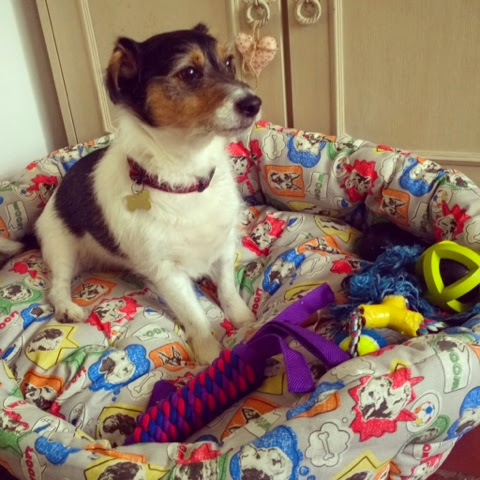 Before we left, we also treated our dog to a new bed. His old one had seen better days and now we have removed one of our sofas, which he used to sit on, we felt he needed somewhere comfy to sleep. And the fab comic book style dog print was just perfect and looks great in our dining room - it even got the cat's seal of approval! It's a question that I've asked myself many times and one I know that other bloggers often wrestle with. Of course, we have an answer - usually the same answer - ready and waiting for when someone inevitably asks us the question. Because we want to document the life of our family, the growth of our children, and have a record of happy memories to look back on, when our children are grown and we scratch our heads and wonder where the time has gone. It's an answer I have given, in one form or another, many times and it's one I've heard even more often. 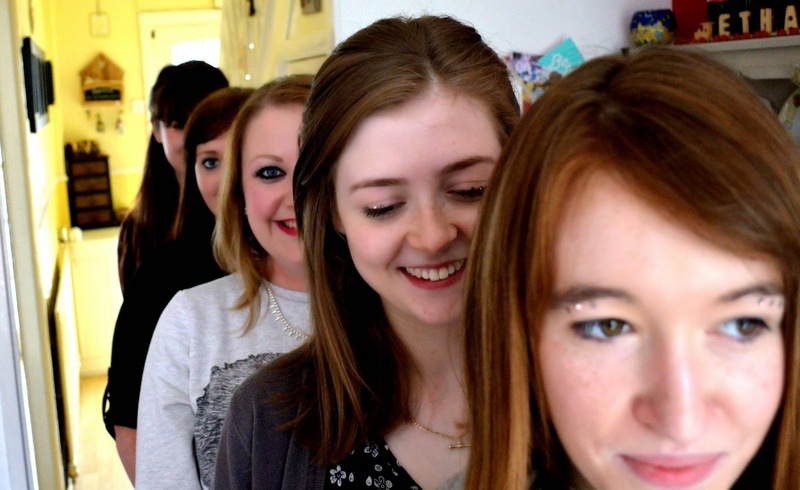 It's a given amongst the mummy blogging community - we're doing it to save our memories. And it's a damn good reason, don't get me wrong - I feel very passionately about being a mummy blogger and defended everything it stands for to great response - but there's a bit more to it really, isn't there? It's not just about writing and sharing - if you want to be successful, there's A LOT you have to think about, depending on how seriously you want to take it - there's a lot I could learn from this SEO expert when it comes to making my content go further! Blogging is a means of expression, whether you're a natural writer-type or just someone who wants a space on the internet to call their own. It gives you a way to get all your thoughts and feelings out of your head and your heart and onto the screen. The process can be really cathartic, particularly if you're having a tough time and need a bit of support. And we all do, don't we, from time to time? Whether it's a case of being able to say 'don't worry, me too' or just a chance to vent, being part of the blogging community means you can always find support, wherever you are and whenever you need it. You can always count on another mum to be a) honest and b) up in the wee small hours of the morning! It's a way of sharing how we feel, what we're doing and the interests we enjoy when often there's no other way to do it. I began my blog as a way of keeping my friends and family up to date on my pregnancy, as I don't really live near any of them and keeping in touch on a regular basis can be hard. But over time, and with a lot of effort, my blog has become somewhere I can share all sorts of things with all sorts of people - many of whom I don't know in 'real life' so to speak. Real life. It's a funny concept, that you have a 'real' life and an 'online' life. I guess it's true - you can choose who you want to be online. That's the joy, and the worry for some, of being part of the social community. When I went to BritMums and Tots100 Blog Camp, I talked to quite a few people about this and how nice it was to 'really meet them'. But, if you really think about it, our blogs are one of the places where we are at our most 'real'. For those that share the highs and lows of parenthood, blogging is a way of sharing experiences, good and bad, warts and all, in the hopes of helping other people just like us. From challenging stages with our children to sharing our passion or interest or enjoyment of a place or product or person, our blogs allow us to explore everything that we are and to connect with people in a way that, for many, is just not possible in 'real life'. It can be silly or serious - anything goes. And the more you share and the more you connect, the more doors blogging can open. New opportunities come around and it's exciting to see where your humble little blog can go. 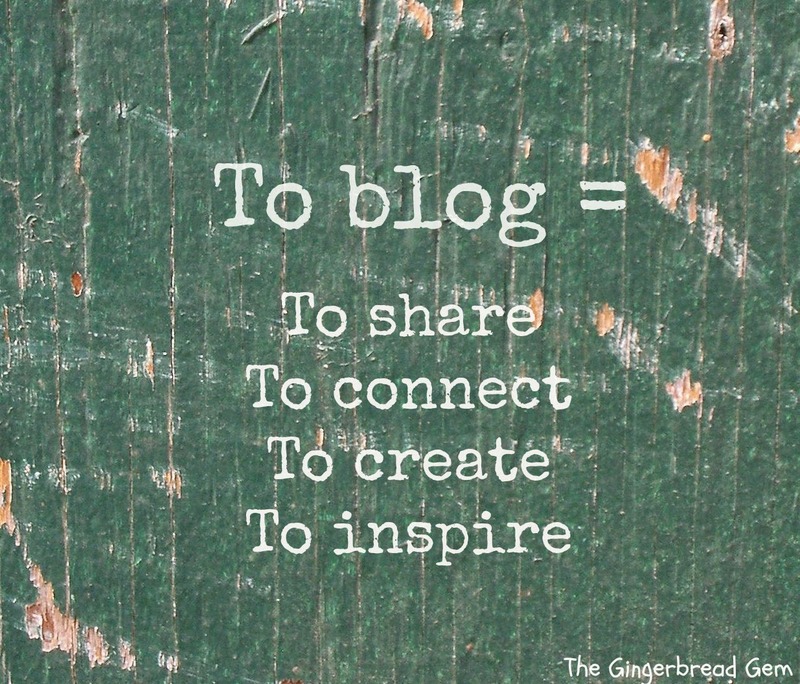 The blog's the limit! And it is all very exciting and encouraging and affirming. Because people are listening to you, talking to you, laughing and crying with you. 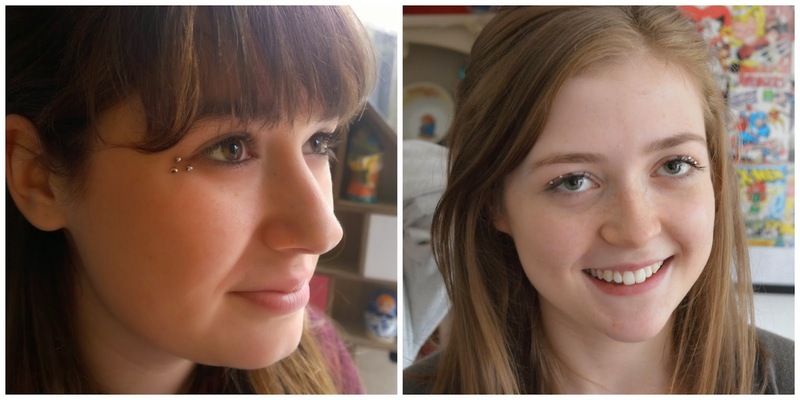 People you would never have had the chance to meet but whom now you can turn to when you want to swap make up tips or practical parenting advice. The more you do as a blogger, the more you can and want to do. There's just not enough hours in the day and sometimes it can seem like it's all too much, and that's often when we'll ask ourselves the question - what are we blogging for? I've found that attending events such as BritMums or Blog Camp are an experience that's both inspiring and frightening in equal measure. It can make you feel really proud of what you've accomplished. Big pat on the back for everyone, well done, you're making a valuable contribution to the community, both parents and online, that brands are sitting up and taking real attention of. But at the same time, you start to question what you're doing as there will always be another blogger - or in real life, another mum - that seems to be doing better. It's very hard not to compare your blog, and yourself, to others. The more you read, the more you want to write. There's so much support and inspiration out there and as much as we all consider our blogs as a way of recording our family's milestones and memories (something that's written in my Twitter profile), we're not just doing it for ourselves. We're doing it for other people, like us, who are looking for ideas and advice and information and a distraction. 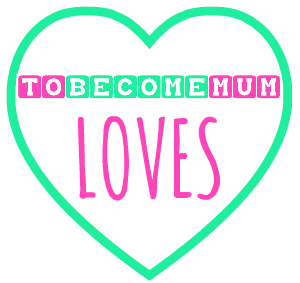 I know how much I have gained from blogs during my time as a mummy so far - much more than any other resource at my disposal - and in some way, I want to try and do the same for other people. Whether I've helped save you time on finding a Santa to visit this Christmas, helped you with my weaning tips, made you think when I've written about a certain Atomic Kitten who just happens to have had lots of children by different dads, or brought a smile to your face with my monthly letters to Ethan, I'm just trying to make a contribution that someone, somewhere will enjoy. Because if I enjoy writing it, hopefully someone else will enjoy reading it. 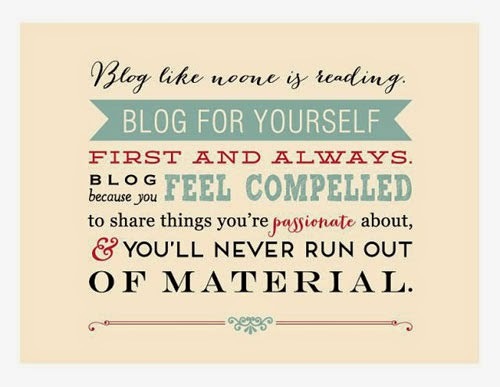 I guess the point of this post is to celebrate all that it means to be a blogger and to gain a bit of perspective. I often get asked how do I find time to blog and really, if it's something you enjoy, no matter what it is, you find time for it. I do it to keep a record of Ethan as he grows up. I do it to share the different things I'm interested in and the things I have done or tried. And I do it to feel a part of something. I consider myself very fortunate to have had the opportunities I have had because I own this little blog - and I've worked hard to make the most of these - and we should all feel proud of what we do. The trouble is, it's all too easy to worry or to want more. Being part of the Tots100 network, for instance, is great but at the same time, it amplifies competitive natures and can make you feel validated in the best case scenario or lost at the other end of the extreme. None of us really understand how the chart ranking is worked out - it's all too complex for me to fathom - but I bet no matter how relaxed you may claim to be about it, you still check your ranking position each month. Of course you do. It's fun to find out how your blog is doing and there's not a blogger who can honestly say that, on reflection, they only write their blog for themselves and they don't really mind what other people think. If that was the case, you wouldn't publish and promote. We live in a society where we constantly worry about what people think of us. And it's not just the media that creates this - the pressure is coming from within. Raise your hand if you're a blogger and you've felt guilty or worried of panicked because you don't have your next few posts drafted and ready to go? How many feel like that right now? It comes back to 'real life' again, getting in the way and making us get behind in our blogging. I spoke to other bloggers at Blog Camp about this feeling of pressure when it comes to keeping our blogs up to date, linking in with people and making time to connect and to grow what we have built. It seems I'm not alone. But, as much as I love reading other people's blogs and tweets and looking at people's photos every day, I really don't mind if you haven't done anything today. Or yesterday. Who set the rules about blogging? Isn't it supposed to be fun, something we do when we have something to say or share? I try to publish a post every day but sometimes, real life gets in the way and I would worry about my blog. Like I would get behind, disappoint people or lose the race. But who would really notice, or mind? We all know that we all have real lives to lead and the pressure is probably all in our heads. Things such as the Tots100 rankings add to this feeling that we're in a competition and that we have to do more, share more, link more, sell more in order to be more. I've taken some time and reflected on my blogging journey so far and I want to make a conscious effort to have more 'control' over what I do. I set the rules of how this blog looks and what it says and it's not the be all and end all whether I post each day or not. The more you put in, the more important it becomes, I get that, but I want to make sure that I'm enjoying the ride and not feeling some kind of pressure to be better. Trouble is, we all want to be better. Better bloggers, better mums. When really, we're pretty damn great as we are. That's what we're blogging for. If you're like me - hyper-organised and excited about the countdown to Christmas - you'll already be thinking about the big day. 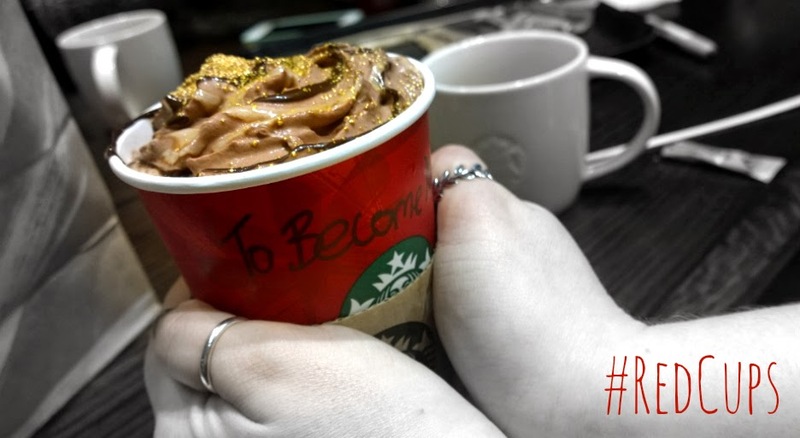 Whether you've started (or finished) your Christmas shopping, gathered gift guides or started your online research, you can never start too early in preparing for Christmas. It's always funny to me how quickly the weeks fly by at this time of year. 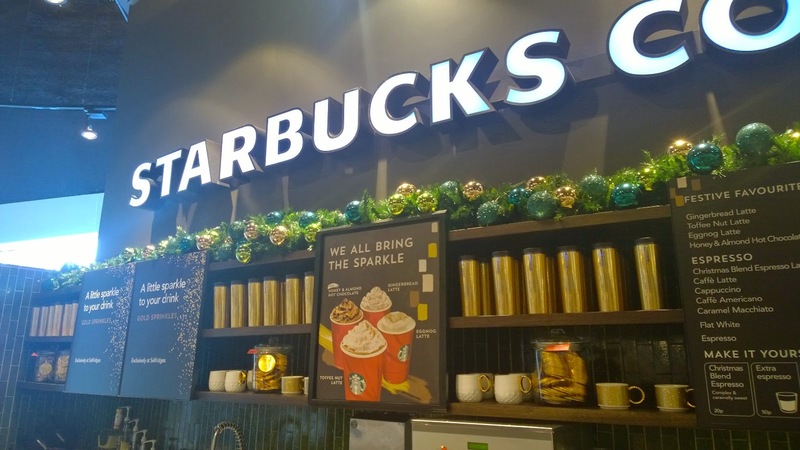 One minute, you have all the time in the world to prepare for Christmas and the next, all your weekends have been booked up by trips to see relatives, shopping and, if you're lucky, a few Christmas parties. No doubt you're little one will have an even more crammed diary than you! 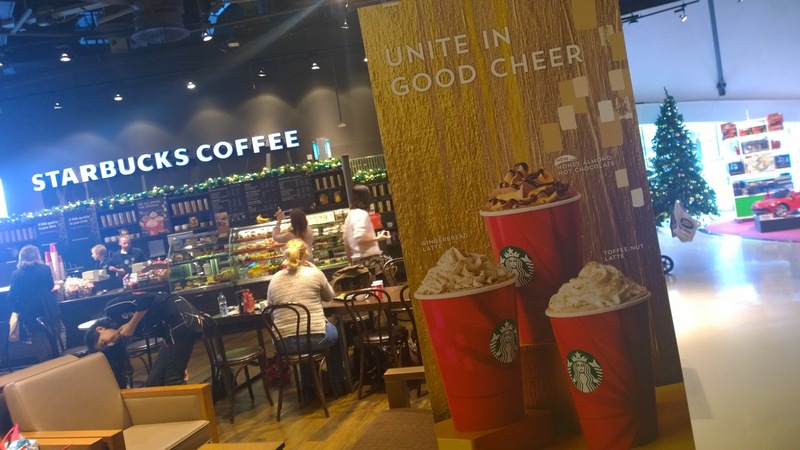 So, in my need to be prepared and in a bid to help you tick one thing off your to do list, I've been researching the best places to meet the big fella in the red suit this Christmas in the Midlands. Last year, Ethan visited Santa during our holiday at Center Parcs and although he won't remember it, it was something we really wanted to do. This year, I'm sure Ethan will be much more intrigued and involved in all the excitement of the season so a visit to Santa is right at the top of my 'must do' things in the lead up to 25th December. 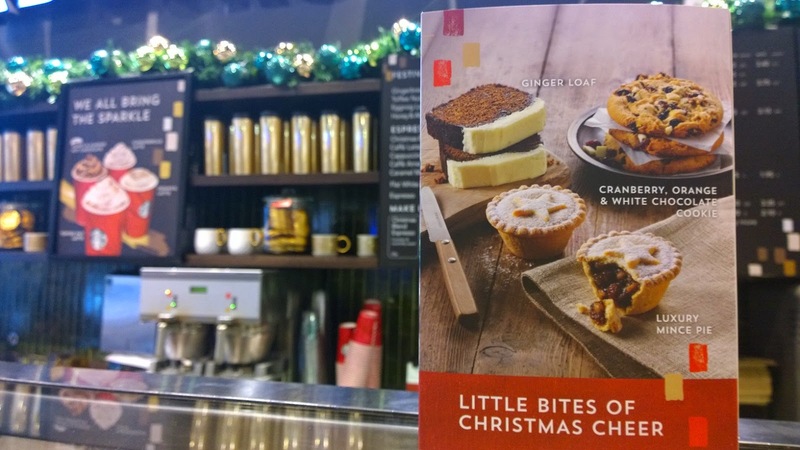 But where will Santa be visiting? Which grottos are the best for a family day out? And which ones offer the best value? Every year, more and more places get in on the grotto act and it seems that this year, there's a whole host of magical experiences to be had. From the conversations I've seen on Facebook alone, I know that many parents feel the pressure to make this time of year extra special and finding THE Santa experience is of utmost importance and this post is well-timed as many people I know are booking far in advance to make sure they have tickets for their chosen event. I'm sure to the children, just going along and meeting the jolly old fella and receiving a gift is all they really want, but as parents, we want to do all we can to bring the magic to life. So, here's my round up of the biggest and best Santa-themed events in the region with all the links you need, which I hope will save a lot of searching - and be sure to let me know which Santa you'll be going to see this year! I love the West Midland Safari Park and we will be going to their Fireworks Festival on 8th November for the third time as it's always such a wonderful night and the bonfire and fireworks are truly fantastic. And who knew that Santa could be found on a safari? Well, he can as part of the Santa Safari experience. You can make a full day of it as the drive-through safari is open and included in the price of your Santa Safari ticket. You can book to see Santa at a time to suit yourselves whilst also enjoying the walk-through Discovery Trail which has lots of various animal features - including a Sea Lion Show and Penguin Cove - before you leave. The Santa Safari opens on 15th November and runs until 24th December on selected dates. Prices are £16.99 adults, £14.99 for children (1-15 years) and £7.50 for babies (up to 12 months). Find out more and buy tickets here. A must for any choo-choo fan! There's the Castle of Dreams, where each child is met by the elves and taken to see Father Christmas in his grotto to receive a gift and a golden ticket to return to the park in the 2015 season. New for this Christmas, there will also be an outdoor ice rink plus you can enjoy the 21 rides and attractions in Thomas Land within the price of your ticket. Before you leave, you must also visit the 4D cinema to enjoy a 15 minute movie experience of The Polar Express. Guide prices are £20 for adults (12-59 years), £15 (4-11 years and 60+), £10 (2-3 years) and under 2's go free. Find out about dates and further details here - tickets are available to buy over the phone at present. Not somewhere I would have first thought of when thinking of Santa grottos but well worth considering as you can make much more of your visit. 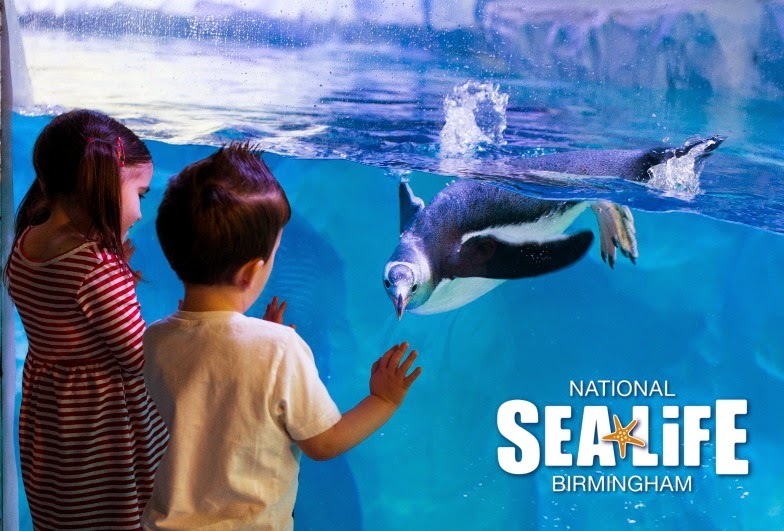 The National Sea Life Centre Birmingham will be running their Merry Fishmas event from Saturday 13th ro Wednesday 24th December. 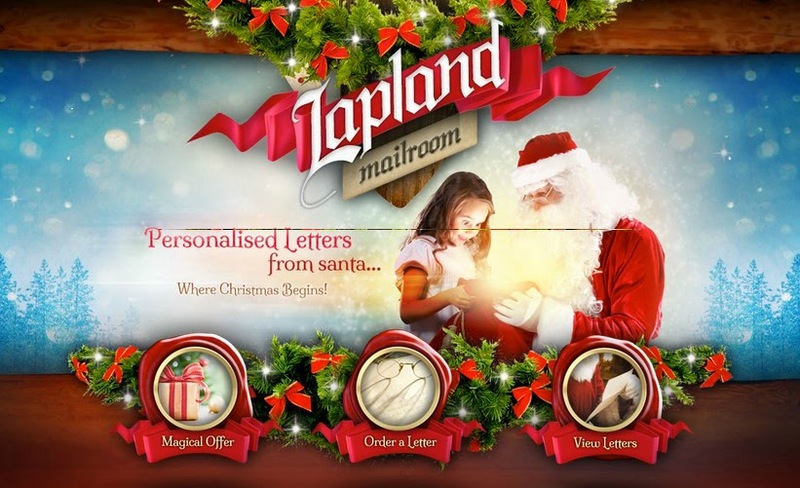 Your children can meet Father Christmas in his grotto located near the Penguin Ice Adventure attraction and they'll receive a present if they've been good. And keep your eyes peeled in the Ocean Tunnel, as it will have a special underwater Christmas tree on display. There's not much information on the website yet but tickets can start from £12.50 if booked online and in advance - take a look here for more information. Taking the simple 'trip to see Father Christmas' to a whole new level, there's a special new event coming to The Belfry this winter. Dubbed as 'the ultimate Christmas experience', this is a premium event which does look magical. 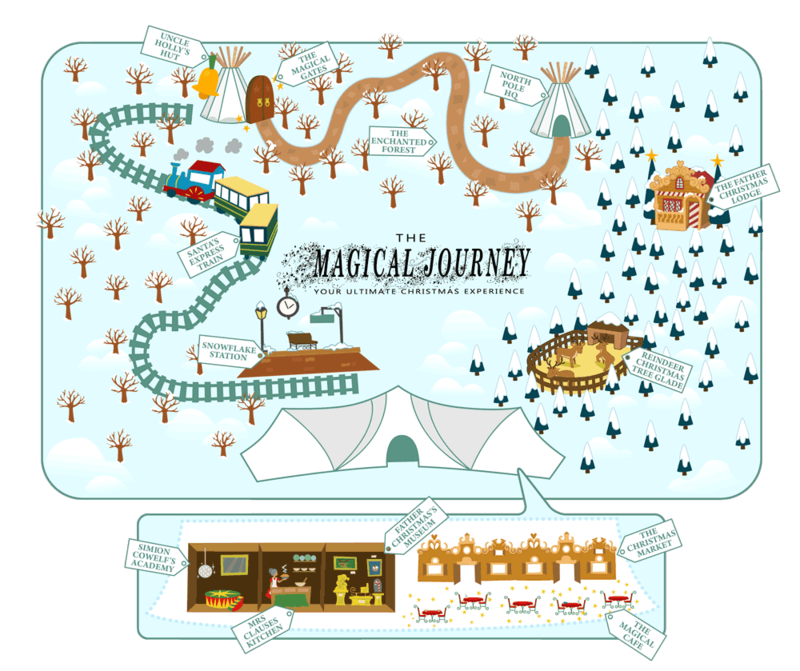 Build across two and a half acres of woodland and designed by Laurence Llewelyn-Bowen, The Magical Journey (see map above) will take you on a tour to help the reindeer find Father Christmas, meeting Mrs Claus and boarding the Father Christmas Express. You'll finally find the man in red at his lodge to receive a gift and meet his real reindeer plus there's a Christmas Market full of craft and food stalls so you can buy some festive treats. A very different and very detailed experience, which will take up to 90 minutes. It opens on 22nd November and prices range from £10 to £15 for adults and £17.50 to £22.50 for children, depending on the date you choose. Find out more here. 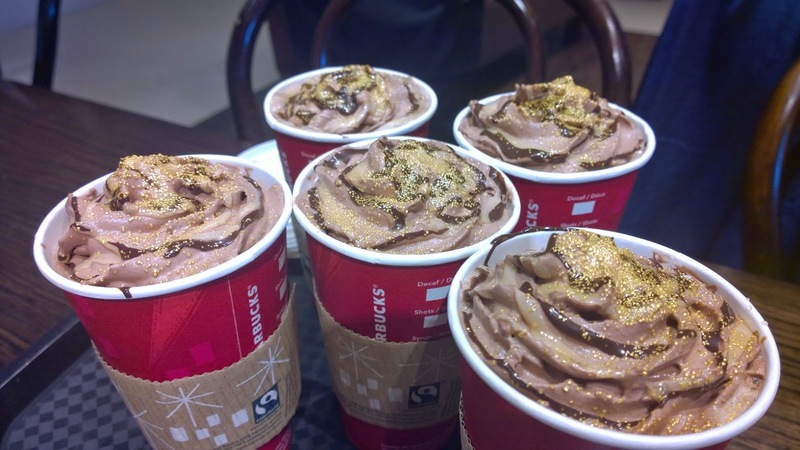 Chocoloate and Christmas - two things that go hand in hand, so what better place to find Father Christmas? 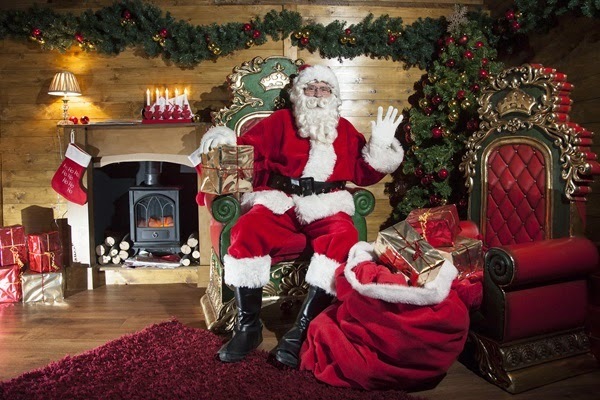 Children can visit Santa at Cadbury's magical themed grotto, and receive the obligatory gift, before enjoying everything else that's usually on offer. Also, Cadbury's is launching their 'Snow White and the Chuckle Beans' series of pantomime style performances during their Christmas Celebration Weekends, which run each weekend from 22nd November right up until Christmas. They say tickets must be pre-booked and prices start from £15.95 for adults, £11.70 for 4-15 year olds and under 4's are free. Visit here for more information. We went along to one of their Victorian Christmas evenings when we were expecting Ethan and we really enjoyed this unique event. If you're looking to meet Santa, the Santa Hunts, which take place on the 29th and 30th November only, are a fun idea. 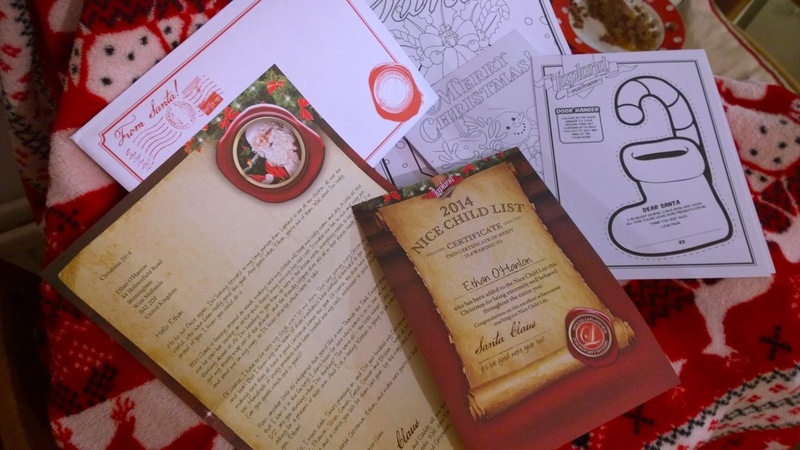 A seasonal scavenger hunt with a prize at the end, children can explore the museum on their hunt to find Santa. You have to call to pre-book if you want to attend and prices are £15.95 for adults, £12,75 for concessions, £8.50 for 3-16 year olds and £6.50 for 0-2 year olds. There's one place that can guarantee a White Christmas - SnowDome Tamworth! I've never been but it looks like a lot of fun and the perfect place to go in the lead up to Christmas. With real snow and real reindeer, plus a stage show and of course, Santa Claus himself, it's certainly worth checking out. 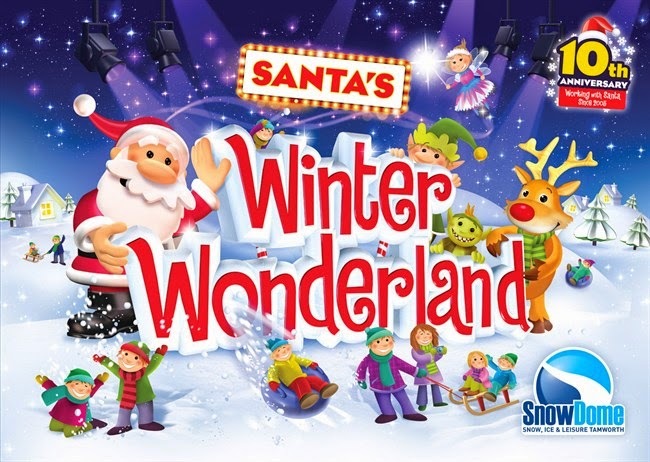 Prices start from £12.50 and the Winter Wonderland opens 21st November and runs until 31st December. 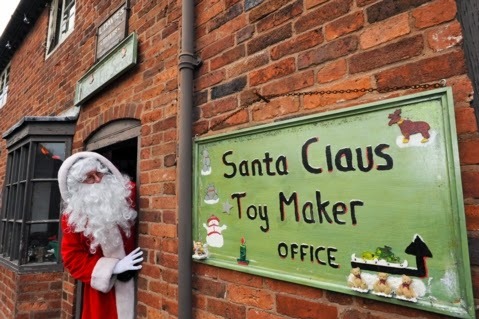 I hope that you find this guide to Santa attractions in the West Midlands for Christmas 2014 useful. I complied this myself as I thought it would be helpful to other parents such as myself. Let me know if you book any of the experiences mentioned or if you have any others to recommend! It seems that year on year, Halloween is becoming bigger and bigger. Maybe it's the influence of America or maybe it's just because we've embraced another reason to have a party, but Halloween is becoming a bigger event. 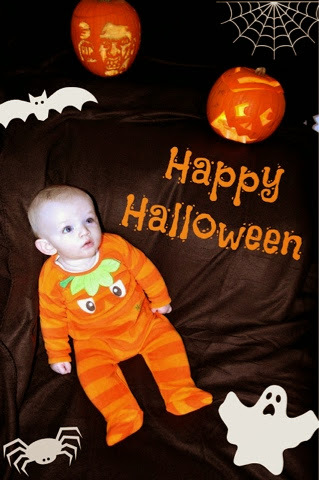 From frightfully good costumes in the shops to ghoulish treats, everyone seems to be going all out for All Hallows' Eve. 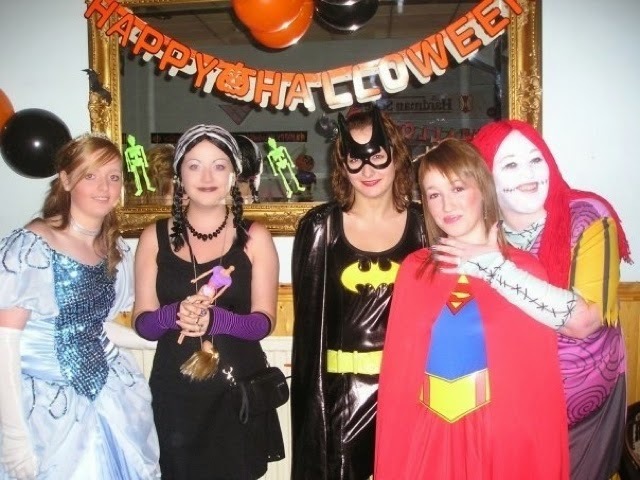 I've always loved Halloween, be it watching scary films at sleepovers when I was a teen or going to fancy dress parties more recently. 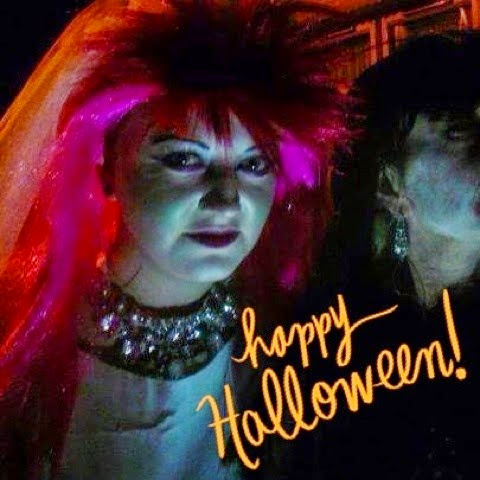 I like the idea of dressing up and becoming something else altogether and have found that sometimes, it can be easier, and more fun, to create your own costume from things you own rather than buying something ready-made. 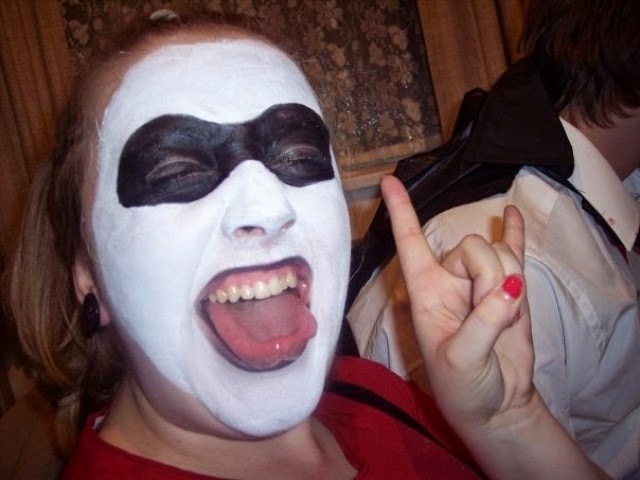 One Halloween, I dressed as Wednesday Adams, another as a comic book character called Harlequin (although I looked more like a member of Kiss) and another as a wrestler (yep that's right!). 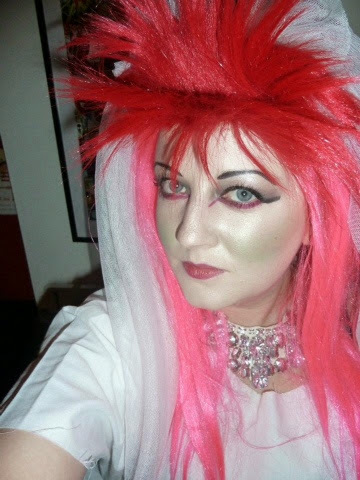 I also recycled an 80's wig and did a whole 'zombie / witch bride' thing. Hey, I improvised. 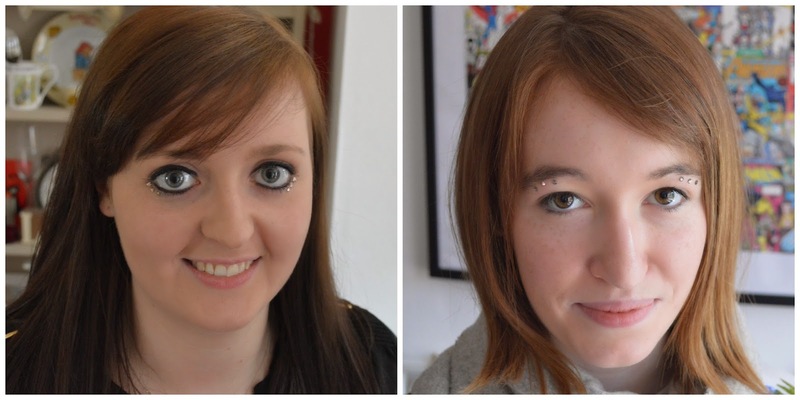 I played with some make up and achieved quite a cool look. 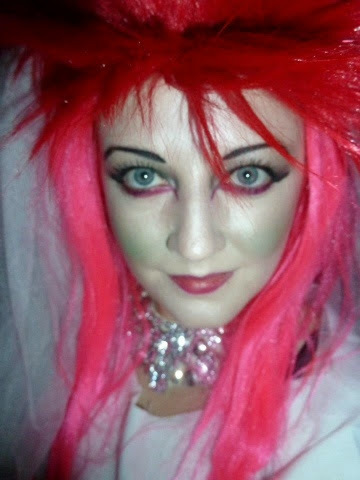 Halloween makes it ok to look a little strange, that's the way see it. For my last look featured below, I used pearlescent eyeshadow instead of face powder and added a green shade to contour my face. I then used red lipliner around my eyes and, under the muted party lighting, it created a rather eerie effect. 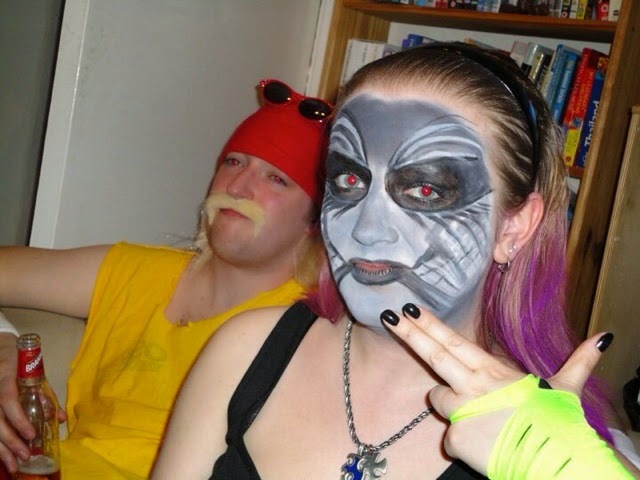 So you really don't have to spend a lot of money to create a spooky look. From a young age, I have enjoyed day trips out to museums, castles, galleries and animal attractions but it still took me 10 years of living in Birmingham before I first visited the Sea Life Centre.We went last year when Ethan was just two months old as it was my birthday and we wanted to have a family day out but obviously Ethan was too young to take it all in. When we went last weekend, however, it was a different story altogether. You see, the Octonauts have come to Sea Life Centre Birmingham on a very special mission this autumn. If you are a parent of a pre-schooler, then you'll almost definitely know who the Octonauts are. In a nutshell, the Octonauts are an eight-member team of underwater heroes who rescue sea creatures, explore underwater worlds and save the day before returning safely to their home base, the octopod. Based on the original books by Meomi, Octonauts is animated by Brown Bag Films, the cartoon is incredibly popular with little ones, including Ethan, and big ones, like my husband and I. I admit it, I often watch Octonauts with Ethan with genuine interest and not just because it's happens to be on. 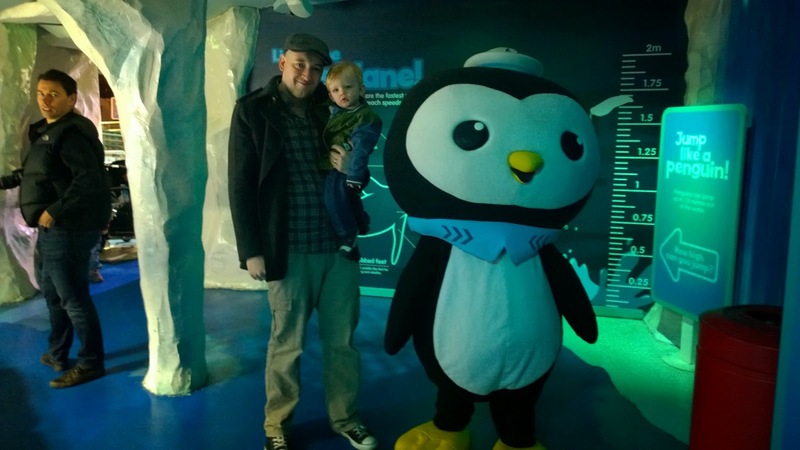 So, when I heard that the Octonauts were coming to the Sea Life Centre, I knew it was time for a return visit - and I don't know who was more excited, me or Ethan (probably me). A collaboration with the Sea Life Centre is an obvious link and one which has been used to great advantage. 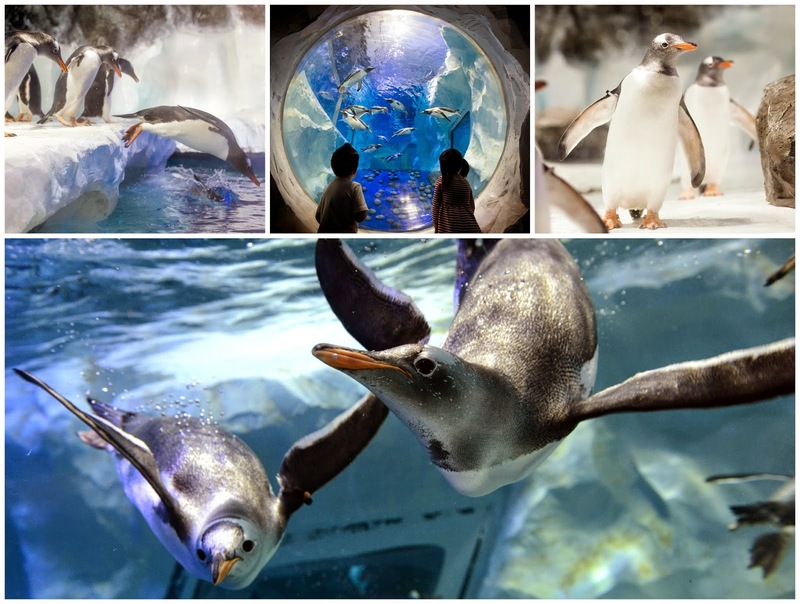 During their special Sea Life Centre mission, children can meet with Kwazii (the cat with the eye-patch) and Peso (the penguin) and have their photos taken whilst enjoying various activities; including a new quiz trail, activity books, stickers and more. The Octonauts are only at Sea Life Centre Birmingham until Saturday 30th November so you'd best be quick and book tickets if you have a fan in your house. It's a great time to take your children along and to give them another way to engage with the educational element of the Sea Life Centre and it's the perfect place to go if the weather is less than great. We thoroughly enjoyed our day and although Ethan is still quite young, we know he really enjoyed it too. He was fascinated by the 'tish' (read: fish), pointed with great excitement at the turtles (one of the words he learnt a few weeks ago) and was mesmerised when he saw the jellyfish. But it was definitely the penguins that captured our hearts this time. The Penguin IceAdventure, which is a home to a colony of Gentoo penguins, is the latest feature at the Sea Life Centre and I think they're one of my favourite animals now, they're just so amazing to watch. They are the first area you come to when you arrive and they are captivating to watch. The way the installation is designed, you can watch the penguins diving under water and when you come to the end of your trail around the centre, there's another underwater viewpoint to enjoy. 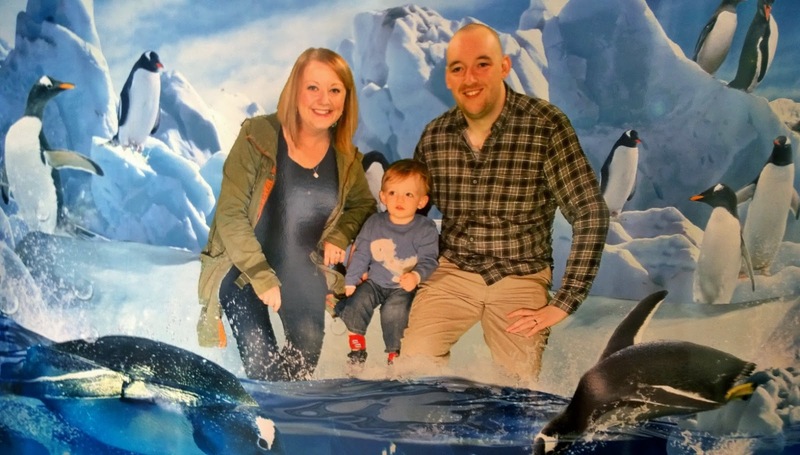 Although Ethan was interested in watching the penguins, it was the rather large penguin, Peso, standing at the end that really caught his attention and he clearly recognised him from the cartoon. 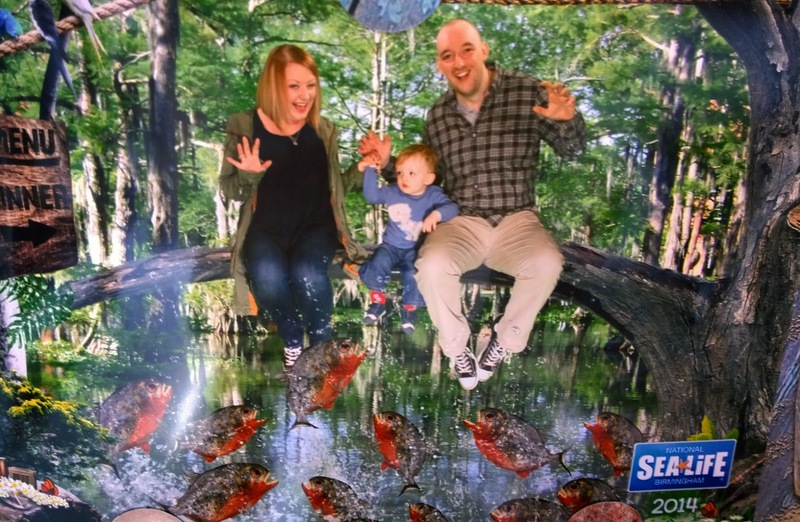 "Pretend your toes are being eaten by piranhas..."
The Sea Life Centre is somewhere I know we will come back to every couple of years. There's lots to see and lots for children to learn and it can be great value too, if you look out for special offers or book online. When will you go on an Octonautical adventure? 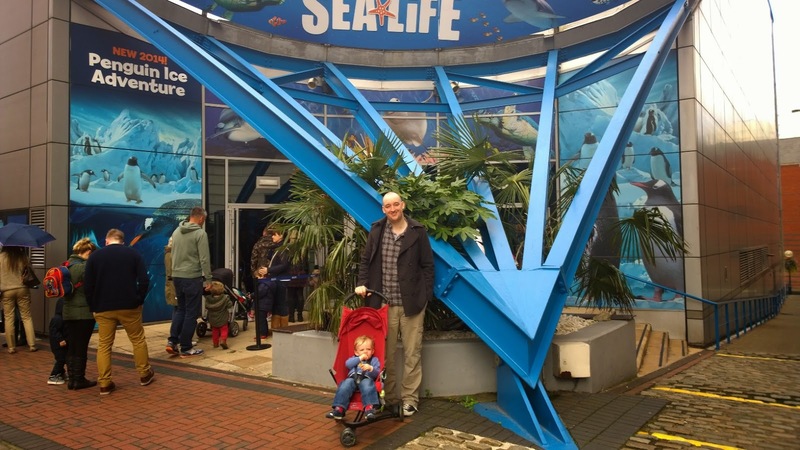 * Thank you to Sea Life Centre Birmingham for inviting us along to experience the Octonauts mission - we had a brilliant time. For any working mum, morning traffic can be a bit of a nightmare. Trying to drop off your little ones and get to work on time can be made much more challenging if you have a toddler that refuses to wear his shoes or if you hit the school run traffic, as everyone has somewhere to be and everyone seems to be running late. This week the RAC in fact announced that the average person spends more than 120 hours stuck in traffic - and I bet a good deal of this is spent on the school run or on the way to work in the morning! So, with the roads often a no-go area, it's a good thing that it's National Walk to School Month is this month as now is as good a time as any to try leaving the car behind and to pound the pavement instead. I was fortunate when I was young to live just one road away from infant and junior school, so walking to school from an early age was something easy for my parents and I to do. Things became even easier when I went to secondary school as I lived right next door but many people I knew walked every day or cycled in. I guess we were fortunate in my home town as everything was easily accessible by foot and from a young age it was just the norm to walk or cycle everywhere. I loved it. Now, living in a suburb of Birmingham and working in the city centre, our lives revolve around my car. We have plenty of things nearby, including Ethan's nursery, but they're all just that little bit too far to walk to most of the time. Particularly when time is the very problem. A trip that takes five to ten minutes in the car can take up to half an hour to walk. If I was working from home, it wouldn't be such a problem but my journey to work takes up to an hour and I just don't have enough time in the mornings as it is, let alone to consider leaving my car behind. That all being said, I think the message of National Walk to School month is very positive and something that we should all reconsider when and where we can. When I was younger, the walk to school was the chance to catch up with friends, and the walk back to talk to my parents about what I had been doing that day. It was also my daily exercise and if I think of my habits now compared to then, I cringe. 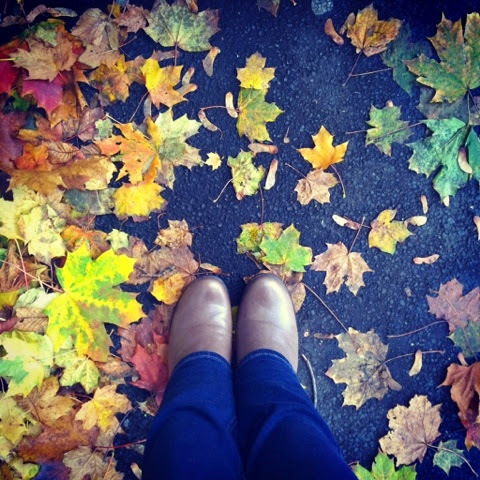 As it's my favourite time of year and I love seeing the seasons change and the leaves turn beautiful colours before they fall from the trees, I was keen to leave my car keys behind and try to go out and about with Ethan more. He's still not walking unaided so unfortunately I'm still doing the hard work ofpushing him or carrying him around but getting outside, taking in some fresh air and making the most of the opportunity to actually look around and enjoy our surroundings, rather than looking at a car bumper, was really refreshing. My husband even picked Ethan up from nursery a couple of times this week, as I have the car, when I was stuck in traffic. With the darker nights and rain that we've had over the last few days, the roads have really been affected and I've been late getting to Ethan and one day I was 40 minutes late for work - and it's only a seven mile journey from nursery to my office! 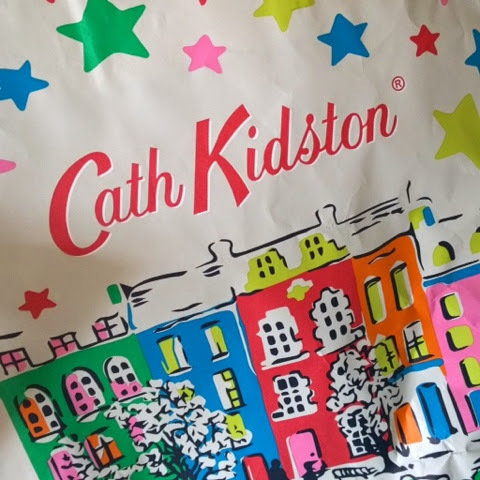 Kiddicare kindly sent us a Buggy Snuggle to use with our Chicco stroller (the snuggle is universal and can be used with almost any pushchair) so that we could do our best to get outside more with Ethan for National Walk to School month. It's a really nice fleece pram liner and foot muff which has a handy pocket, for toys or snacks, plus a two way zip so if Ethan's got muddy feet, they can stick out the end rather than getting the snuggle all dirty. It's a great addition to our stroller and has given us the chance to enjoy the new season without worrying about Ethan being cold. The universal rain cover we bought has also come in pretty handy! It's usually out of necessity we rely on our car which I'm sure is the same for a lot of people. 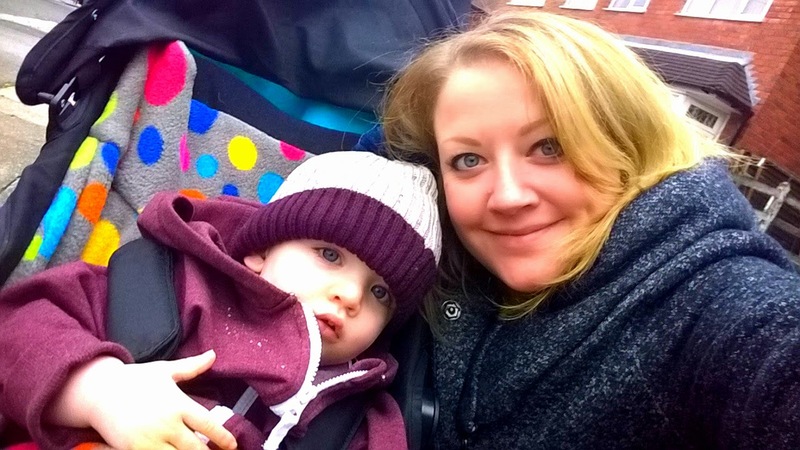 We don't have the time, sadly, to walk Ethan to nursery as the distance is just a little too far when I need to get to work but, when he's school age, there's much more of a chance that walking will be part of our daily routine. I think it's good for us to think of ways in which we can get out and about more on our own two feet rather than four wheels and with a bit of forward planning - getting ready on time and having the right pushchair and accessories - certainly makes it much more possible. 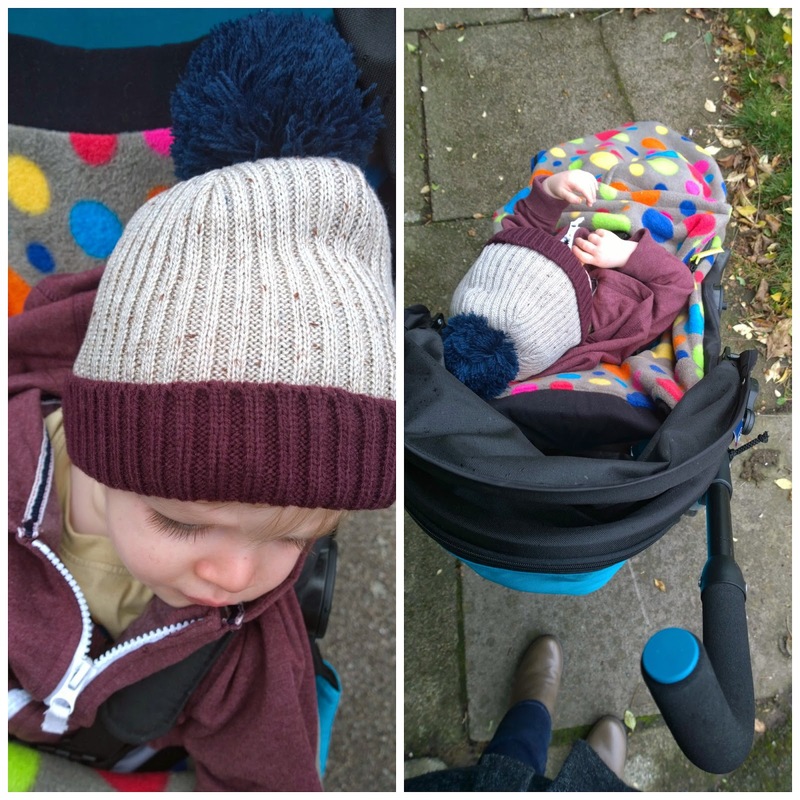 * Thank you to Kiddicare for sending us the Buggy Snuggle to help us get out and about more this month!